People are not happy with the way Deputy Attorney General Rod Rosenstein has managed the Russia investigation. Two House Republicans, in particular, are planning to file impeachment documents against Rosenstein as early as Monday. Both House Republicans are members of the House Freedom Caucus and have a problem with the deputy attorney's poor handling of the Russia investigation. 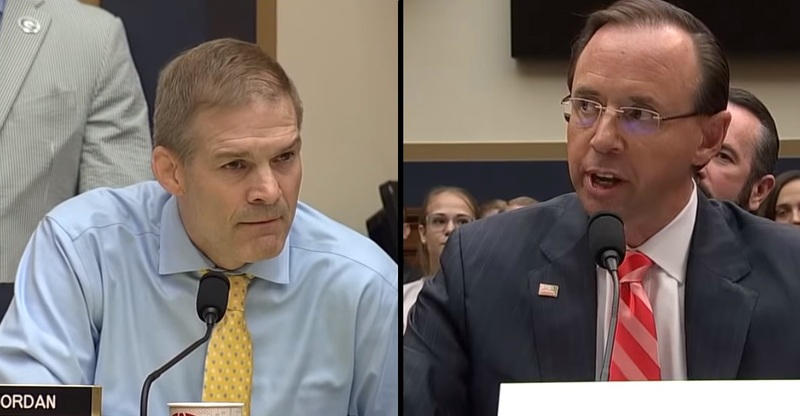 Reps. Jim Jordan and Mark Meadows say, Rosenstein, who is responsible for special counsel Robert Mueller's scandal-ridden probe into alleged collusion between Russia and the Trump campaign, has continuously refused requests from congressional Republicans to access documents related to the investigation. Rosenstein also attempted to protect FBI agent Peter Strzok, a former Mueller team member who is a self-proclaimed anti-Trumper. Politico sources confirmed Meadows was seen on the House floor with Rosenstein's impeachment documents Friday afternoon. Meanwhile, the deputy attorney general was announcing new indictments in Mueller's case. "It has not been filed today," Meadows spokesman said but he didn't rule out the possibility of the impeachment documents being filed as early as next week. The 12 indictments against Russian operatives were seen as poorly timed and possibly even meant to subvert the president who was simultaneously visiting a string of political world leaders in Europe, including an upcoming summit with Russian President Vladimir Putin. Even House Speaker Paul Ryan reportedly backed a House measure that condemned the deputy attorney general for stonewalling the requests for FBI documents.